Shinei Screen Inc. aims to advance eco-friendly products and technical innovation in order to protect and improve the environment based upon the philosophy that a company is a member of nature. Under the philosophy, the company aims to realize human- and eco-friendly society through the whole company activities. 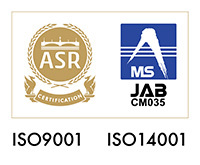 ■The company obtained verification of ISO 14001 Environmental Standard. ■We comply with the directions of RoHS and don’t use lead in our products. Through manufacturing screen printing products, decorative products for festivals and events, and display units and components, we aims to become an eco-friendly company. We aim to advance eco-friendly products technical innovation in order to protect and improve the environment. Under the philosophy, we aim to realize truly rich society. 1. Complying with environment-related laws. We comply with environmental laws, ordinances, agreements, and requirements of customers and the industry. We voluntarily and actively work on environment protecting activities. 2. Decreasing environmental load and protecting pollution. We strive to use resource and energy effectively and save them. We use materials, parts, and ink that are eco-friendly. We decrease bad effects of production on the environment. We aim to curb industrial waste and reuse it. We treat industrial waste not to worsen the environment. 3.Setting environmental objectives and goal. We set environmental objectives and goal in order to decrease environmental load and pollution by reviewing business activities, production, and services from a point of environment protection. We aim to implement environmental policy and perform continual improvement of environment management. We implement internal environmental audit to maintain and enhance voluntary environment management. We also educate employee so that they understand environmental policy and enhance environmental consciousness. We guide suppliers and subcontractors so that they understand environmental policy and enhance environmental consciousness. We disclose the policy inside the company and also disclose outside the company if it is required.